Why Does Congress’s Only Cherokee Member Keep Voting Against VAWA? 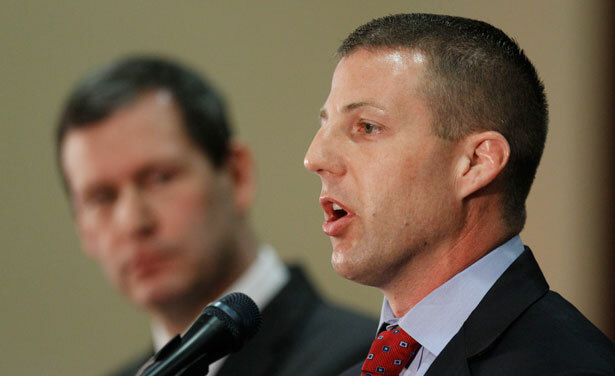 Markwayne Mullin (R-OK) voted against both versions of VAWA reauthorization. If only he would explain why. Native representation in Congress doubled as a result of the last election—from one to two representatives. In January, political newcomer Markwayne Mullin (Cherokee) joined Tom Cole (Chickasaw), who has served in the House since 2003. Both Republicans represent congressional districts in Oklahoma—and might illustrate what’s at stake when the Democratic Party fails to engage Native candidates. Representative Mullin voted against two versions of the Violence Against Women Act (VAWA) reauthorization yesterday, but won’t explain why. The Senate had already approved an expanded version of the bill, which allowed for the prosecution in tribal courts of non-Native men who attack Native women on reservation land. Native nations operate under tribal sovereignty, and as such, their own courts administer justice. A good way to think about it might be to consider a perpetrator from New Jersey who attacks women in New York: New York could easily prosecute the defendant without jurisdictional objection. The Senate version closes that loophole, and restores the way non-Native men who attacked Native women on reservations were prosecuted before 1978. The House introduced its own version, which critics said didn’t address weaknesses in the bill for LGBT survivors, as well as immigrant and Native women. The issue of tribal sovereignty seemed entirely lost on some members of the House during yesterday’s debate. Representative Kevin Cramer (R-ND) shared a moving story about a 2-year-old child who saw his stepfather beat his mother to death. Cramer—who represents a state with one of the highest Native populations—explained that he knows “the scourge of violence against women personally,” since he and his wife adopted that little boy. Yet he took to the floor to support the House version because he felt that the sovereignty issue addressed in the Senate bill was about what he called a “good political slogan,” but not good law. Yet other GOP lawmakers, including Shelly Moore Capito (R-WV) and Charles Dent (R-PA), stood against the House version, and in support of the Senate version. After the House version failed, Cramer and other Republicans joined the majority and passed the expanded Senate version. Representative Cole, who has sometimes expressed frustration with lawmakers’ limited familiarity to grasp basic Native issues like tribal sovereignty, had worked with Darrell Issa (R-CA) to create a separate amendment. It would have allowed non-Native men the option to request their cases be removed to federal court—a move considered a good compromise by most Natives wanting to move the bill forward. But the Cole-Issa amendment was never even heard for debate. Representative Mullin, meanwhile, voted not only against the Senate version but the House version as well. Phone calls and e-mails to his office and press secretary were met with silence all day yesterday—so it’s hard to determine why. Mullin, a Tea Party darling and Constitutionalist, ran a campaign on fiscal conservatism. Perhaps he didn’t like money being poured into a federal program that protects women. In the end, he was one of only twenty-seven House Republicans who voted against both reauthorization versions. As a first-term lawmaker, he has already illustrated that he won’t necessarily stand with other Natives and their best interests in Congress. During yesterday’s debate, members on both sides of the aisle made passionate statements about their positions. Noticeably missing from those debates were the voices of Native women. To date, not one Native woman has ever served in Congress from any party. As legislation begins to change, perhaps representation will, too. The fight against sexism—at the Oscars, and the world over—can be exhausting. Read Michelle Dean’s commentary.